This wipe is your answer to personal hygiene when there is difficulty in reaching. 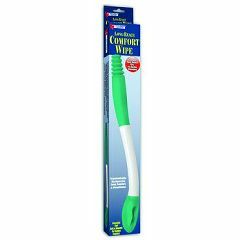 Ergonomically shaped this wipe is designed to help people with limited dexterity. It has a soft and flexible head that grips toilet paper, tissue or pre-moistened wipes securely. It also has a unique release button for fast, sanitary disposal. This handy device can extend your reach by 15.75" for better cleaning. After back surgery. After back surgery. Cannot easily reach area. Senior with arthritis. Back problems. When tissue/wipes are wrapped correctly with ends tucked into the holder, it works just fine. Also useful for applying hemorrhoid ointments. Easily washed in hot soapy water. Cumbersome. Cumbersome. Does not fold. Paper must be manually remove after use; clicking button at bottom doesn't work. spring inside sticks. IT IS OK.. Product could be a little longer and have a better spring inside for the release. I have used it 5 times and it stuck the 3rd time I used it. I have to manover it back into place.